If you want to know the minute the next book is out, please sign up for my newsletter and please make sure that you add my email address (diane@dianedarcy.com) to your list of contacts. Thanks! I write romance novels with a hint of magic and I'm a sucker for a happily ever after. and get up-to-date news about my upcoming books. At the moment, my books are only available on Amazon Kindle. If you want to download a book, but don't have a Kindle, here is a link for a free application to convert Kindle to your PC, iPad, or Android. It’s the wedding of the century … and the groom’s been stabbed. 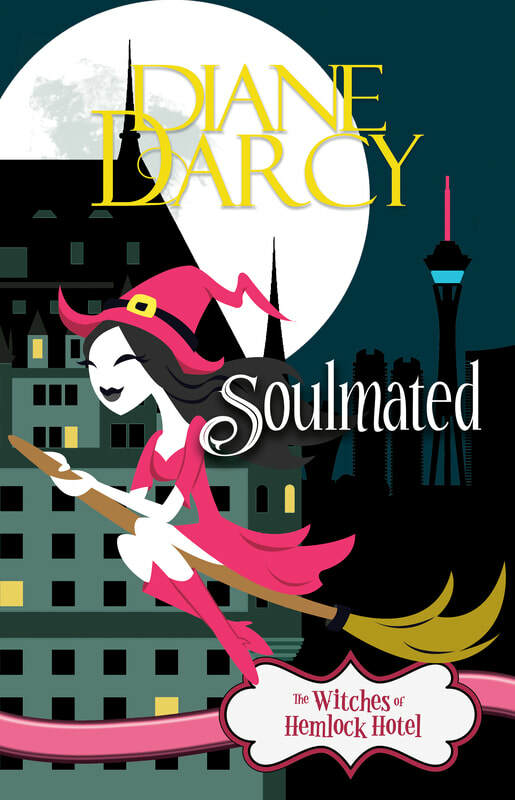 When Las Vegas psychic, Lena DeVille, reluctantly allows her sister to sign her up for the dating web site, Soulmated, she isn’t expecting to get matched with a werewolf. Seriously, why can’t she catch a break where her love life is concerned? William Murray, head of security for The Hemlock Hotel and Alpha of his werewolf pack, has waited seven hundred years for a mate to call his own, and he’s not letting Lena slip away. Add in the death of the groom by wedding cake knife, and a close look at Lena’s ancestors, and a new and interesting world most people overlook, and things just keep getting more complicated. Las Vegas psychic, Lena DeVille, has a boyfriend who thinks he’s a werewolf. They might have to break up. However, when a new mystery crops up, she’s unable to resist. A young lady’s been kidnapped from The Hemlock Hotel (maybe) and Lena is starting to realize that things are not quite as they seem within the walls of the most popular resort in Vegas. There’s a family on the verge of going wild (literally), witches hoping she’ll join their coven, and her own magic making an appearance. Not to mention local boys trying to make a buck, a little breaking and entering, and a reporter determined to uncover secrets. Can Lena resist William, find the kidnapper, and rescue the girl before it's too late? Or will their investigation have her becoming a target for a madman hiding in plain sight?